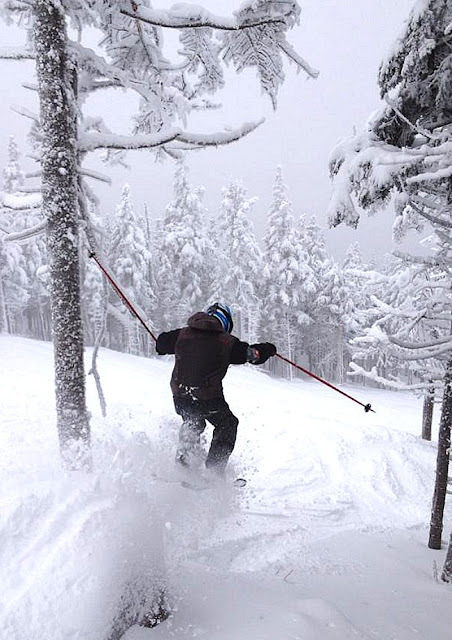 @MaineSkiFamily made a quick decision and made it to Saddleback to take advantage of about 30 inches of snow that fell this week. We are very glad we went! Saddleback basically had everything off the Rangeley and lower Quad open. Grey Ghost and Royal Coachman had a full groom and skied very well. They ran a single groomer track up Lower Professor, Lower Jane Craig and Professor to allow folks to play in and out of the side powder which was fun. This is great base building snow. Not blower powder for sure, but a good solid snow to fill in the base. I call it a 'thick' consistency. You could easily move it around, but it was not flying way up in the air like a lighter powder would. Very skiable however and a great way to get the season going. Peachy's Peril Held Great Snow! It was still early season a bit. Some of the ungroomed still had lots of bumps from waterbars and various twigs and grasses stick up but nothing to get in the way of skiing. The glades were great. Lots of snow and we were not hitting any stumps or debris. By far the earliest we have been in the glades. We did not have a bad run today. They were all good until our legs gave out around 3pm. 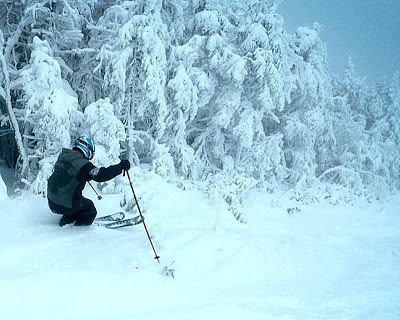 Hopefully this next storm stays white up in the Rangeley area and we keep building momentum for Christmas Week! We shot a few quick videos today. Our legs are still in early-season form but you can get a sense of how much snow there is. Check out our video snow report below! Cool video. I enjoyed watching. You just made me miss skiing. We moved in a place where there is snow and it's been two years of missing the winter sports. Thanks for sharing.